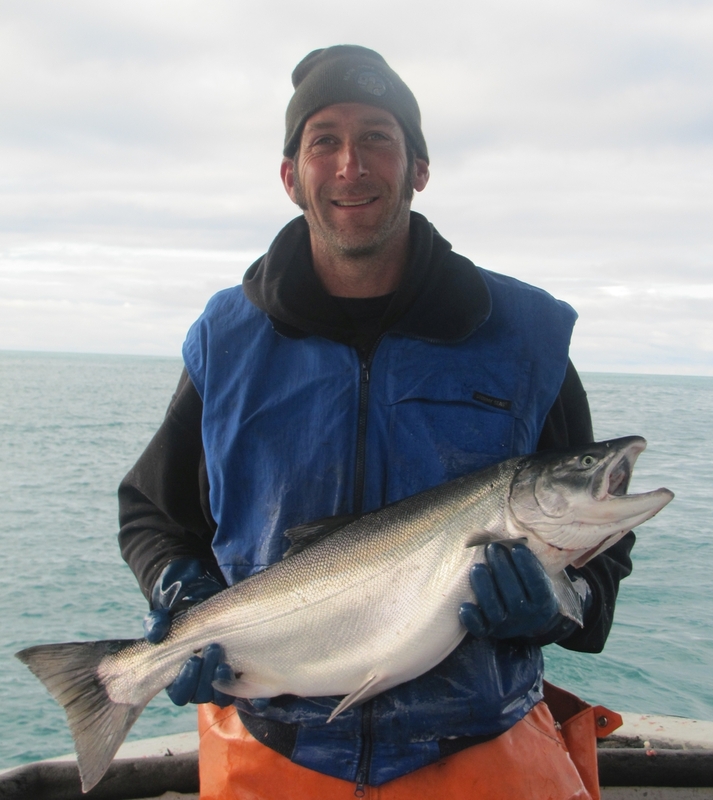 We specialize in providing ocean-bright Alaska silver salmon. The closest relatives to the king salmon, silver salmon may be the most successful salmon of the five Pacific species, with fish occurring in almost every accessible body of fresh water in their range. Average adult size is 7-12 pounds, but can range to 30 pounds. Silver salmon spawn later, in October and November and some into January. They can live to 5 years with most spawning at 2-3 years. They are amazingly powerful swimmers and can leap vertically more than 6 feet. They are voracious eaters as they head back inshore to spawn. It is a pleasure to watch these metallic silver and blue beauties leap, swim and school. They are an exceptionally tasty fish, known for their firm flesh and mild flavor, and considered by many, the best salmon for the barbeque. Troll-caught wild Alaska king salmon is one of the finest delicacies. The state fish of Alaska are the largest and least abundant of the Pacific species. They range from Monterey Bay to the Chukchi Sea, Alaska. Southeast Alaska is unique as a mixing ground of king salmon from along the Pacific coast. Their flesh can vary from white to pink to red, with white kings most prevalent in Southeast Alaska, making up 30-40% of the catch. King salmon spawning rivers are generally fewer than other species due to more particular spawning requirements: streams with good flow and gravel bottoms, because their large eggs require more oxygen than other species. Average weight of adults are 15-18 pounds, but have ranged to 126 pounds. Kings live up to 8 years and spawn at 4-7 years of age, from July-September. Both species require clean, freshwater rivers or lakes for their tiny young for 1-3 years. Adults spawn each summer in these habitats, with females digging a "nest" with their tail in the gravel. After the male swims by and fertilizes the eggs with milt released in the water, the fish cover the eggs in gravel. The eggs will hatch 2-4 months later, depending on water temperature. All Pacific salmon adults die after their one breeding event. Salmon can migrate up to 10,000 miles during their time at sea. To navigate, they use their sublime abilities to detect direction of water flow and to sense subtle shifts in temperature, and their very acute sense of smell, said to be thousands of times that of dogs, to detect watersheds and water masses. Alaska salmon management shifted from federal to state control in 1960. Opening times, durations, and areas are set by the state Board of Fish based on extensive real-time within-season data collected throughout the state. The Alaska Department of Fish and Game conducts research, advises the Board, and is responsible for implementing the Board's management decisions. State-based salmon management has been very successful at promoting sustainable Alaska salmon fisheries. The Alaska salmon fishery was first certified as sustainable by the Marine Stewardship Council in 2000, and was recertified in 2007 and again in 2013. Salmon harvests were the highest on record in 2013 due to record numbers of pink salmon and valuable catches in Southeast Alaska. This suggests that overall, healthy populations are being sustained, although certain species and runs are monitored carefully when concerns arise. In addition to state efforts, many nonprofits contribute to Alaska salmon conservation, particularly through freshwater habitat conservation and restoration.